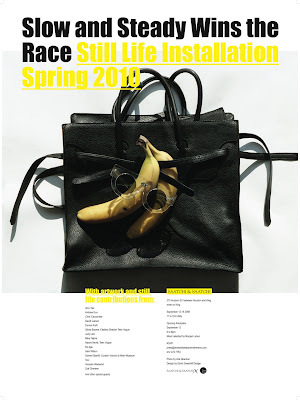 For Nº22 Bag Shoe Slow and Steady Wins the Race transposes two arenas of accessories: the bag and the shoe. Recognizable design elements of basic bags: the nylon drawstring, the canvas boat bag, and sporty backpack. Two examples, one each in flat and heel format add up to six permutations in the newest shoe collection. The twenty third collection for Slow and Steady Wins the Race begins a playful and light-hearted investigation into scale. Commonplace backpack, duffle and bucket bag, bags which are traditionally utilitarian and of a certain size for the purpose of capacity are scaled down to the size of a vanity handbag. Executed in black leather, these bags can feel both like sophisticated shadows of standards or youthful reinventions. Each named the BEST bag, the GREAT bag, the CHAMPION bag, this trio of bags forms a small but mighty collection of objects that comments on the evolution of iconic design elements. Recognizable features are arranged and rearranged to achieve something that is the farthest from recognition, resulting completely in a completely unique object that happens to function also as a bag.